Of course you want only the best: the most efficient, the cleanest, greenest, quietest, and the most reliable generator to power your home steam shower. That makes Mr. Steam eSeries Generators the obvious choice. This exclusive microprocessor operating platform does it all, from the most basic installation to the most elaborate. Think small – about the size of a briefcase – and you’ll understand how eSeries generators can be tucked away, out of sight. You can install the generator up to 18 metres away from the steam shower – and even locate it on another floor altogether. 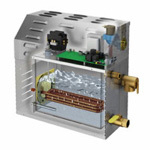 With a water temperature equalization chamber is unique to Mr.Steam, Autosteam® – which comes standard with every generator – assures a continuous flow of steam, with no pauses and no cold spots. eSeries generators use no more than 7 ½ Litres of water for a 20-minute steam shower, making them the eco-conscious luxury bathing option. Comes with a precision temperature probe for optimal steam room temperature control. eSeries generators are made in the USA. Pair with the iSteam Controller to create your own home spa experience or iTempo for concise digitial functionality.